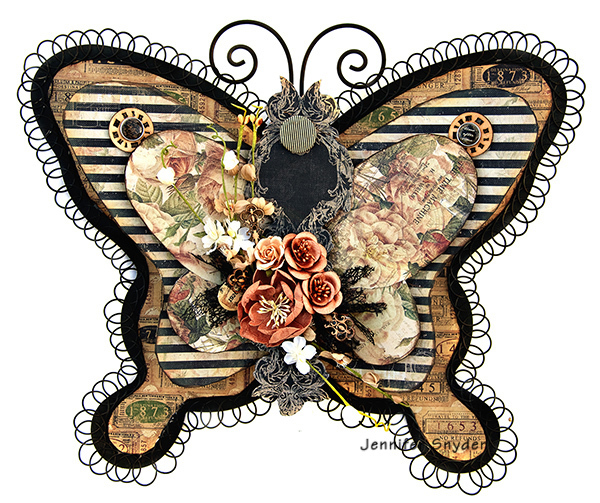 This is a metal wall hanging I created using Prima's new Time Travelers Memories collection. 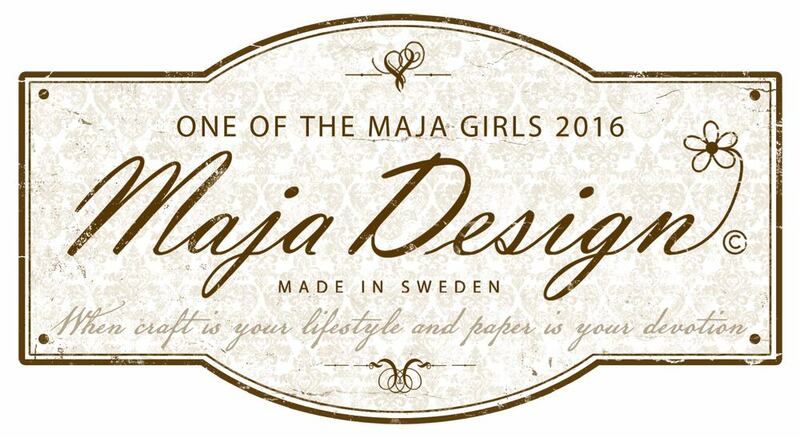 It's a magnificent collection with warm vintage appeal. When looking at the patterned paper, I decided I needed to showcase how amazingly gorgeous the prints look together. 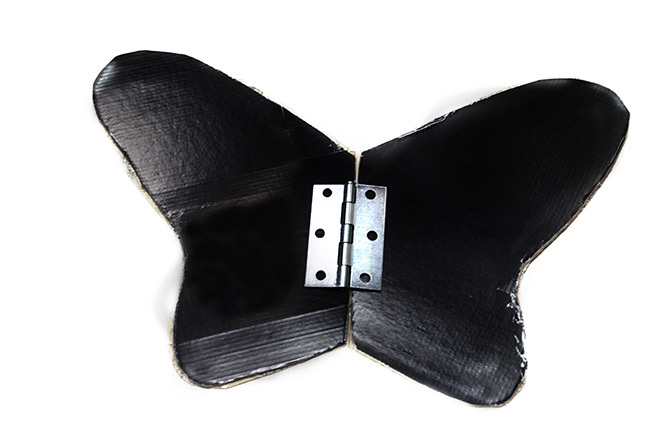 Below is the original metal butterfly base I bought at clearance - though you can kind of see why it was on clearance. A bit drab and frankly boring. And it's big spanning over 12inches wide. So now you have both big and drab. Ho hum. 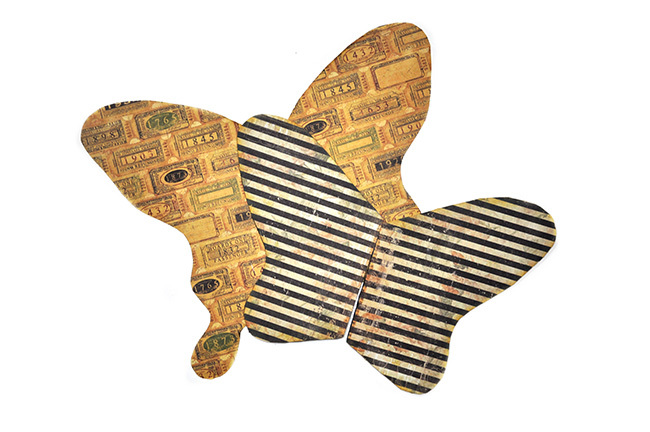 With a little imagination and help from Prima Marketing, let's transform this into the beautiful butterfly it deserves to be! Step 1. I traced the butterfly onto a sheet of white copy paper to get my base paper layer. My base layer is Prima Time Travelers Memories -Tickets Only ( product 813918). Step 2. 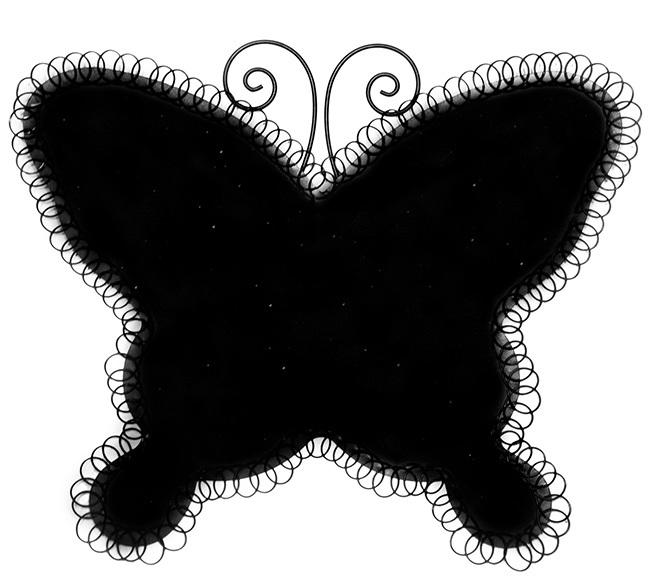 Set the butterfly tracing on a photo copier to reduced the size for the smaller wing layer. This layer is Prima Time Travelers Memories Collection -Dark Lines (product 813895). Step 3. I mounted the smaller wing set onto cardboard. The I cut the wings apart to make two segments. Step 4. I wanted my wings to be angled so I have a little secret that I found works well. I used an everyday hardware hinge glued to the cardboard to keep the wings angled. Works like a champ! Step 5. Before I glued the hinged layer to the metal frame, I added some foam to support the wings. If you look at the photo below, you can see the foam peeking out from underneath the second layer. Keeps them nice and secure. Step 6. 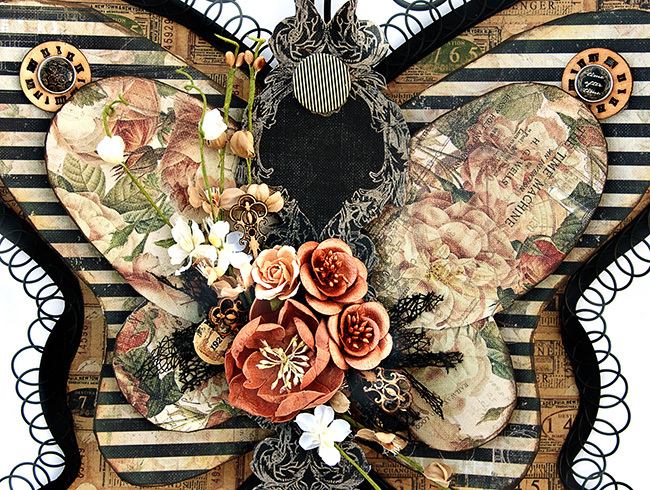 I created a third layer of smaller wings using Prima Time Travelers Memories Collection -Roses ( product 813864). I also backed them with cardboard and cut them in half. This allows the wings to rest nicely on the layer underneath. Step 7. 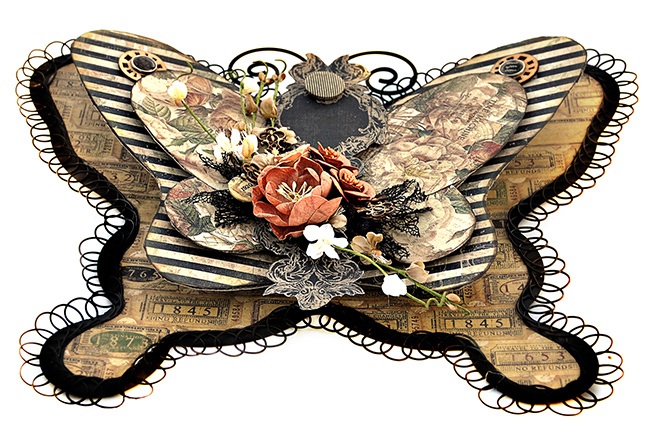 I cut a decorative butterfly body from Prima Time Travelers Memories Collection - Priceless Moments (product 813925). When I saw this paper, I knew right away that it was great for the body of my piece. I added some interest to the head by adding Time Travelers Memories Collection -Flair Buttons. This also gives the appearance of delicate antennas. 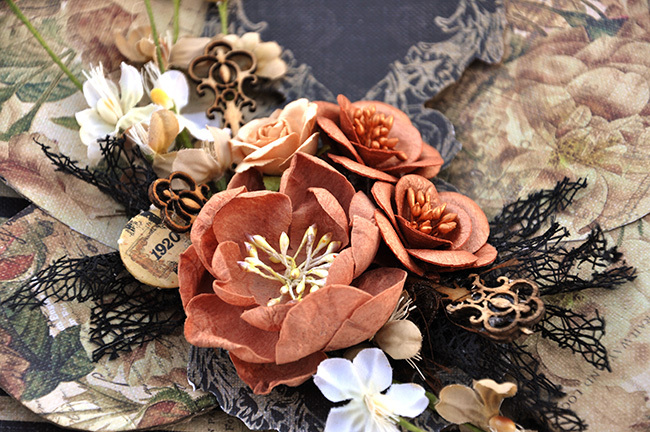 I used the Time Travelers Memories Collection -Wood Embellishment ornate keys in my floral cluster as "picks" instead of keys. They are magnificently ornate and add just the finishing touch I needed in my cluster to complete the vintage style look. Very creative! 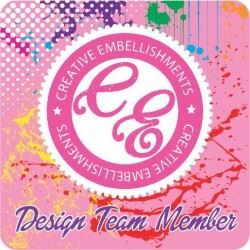 This turned out fabulous! Love the hinge idea and using the keys as picks!